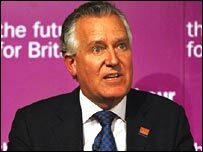 Things took a fatal turn for Peter Hain the moment the Electoral Commission referred his case to the police. His position in Gordon Brown's cabinet was already under huge and mounting pressure, but that decision was the last straw. The prime minister has, so far, expressed full support for his beleaguered minister. But he also placed his future in the hands of the Electoral Commission and the parliamentary Standards Commissioner when he, in effect, said it would be their findings that would decide the minister's fate. In other words, Mr Brown said he would not use his prime ministerial patronage to ride to Mr Hain's rescue if he was subjected to any criticism by either of those bodies. And, as Tory spokesman David Davis said, the decision to refer to police the issue of donations to Mr Hain's deputy leadership campaign suggested the commission believed there was "a substantive case to answer". Bearing in mind the prime minister's pledge to introduce a new, squeaky clean politics, once the commission made its decision, Mr Hain's resignation was virtually inevitable. But, equally, it had always been highly likely that the commission would refer the matter to the police as it has been accepted that the failure to register donations to his campaign was a de facto breach of the law - albeit, it is insisted, an accidental one. Mr Hain has said this was all a matter of an administrative error in his campaign and he is innocent of any wrongdoing. But what has dismayed many, even on the Labour benches, is the fact that at a time when the whole issue of party funding has been causing Labour so much strife, a minister should "take his eye off the ball" in this way. At the same time, there was the fact that the affair was not simply harming Mr Hain but was being used by Labour's opponents to attack the government and prime minister. Tory leader David Cameron had already seized on other issues, such as the lost data discs and the handling of the Northern Rock crisis, to advance his campaign to paint the prime minister as incompetent. That is a powerful weapon against a man whose entire reputation has been based on his competence and reliability and when Mr Brown claimed Mr Hain's woes were the result of "an incompetence" that made matters worse. 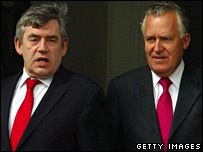 However, Mr Brown was reluctant to lose his minister because to do so would recall the "bad old days" of Tony Blair's regime and might increase the pressure on others caught up in the running rows over donations - notably Harriet Harman and Wendy Alexander in Scotland. The prime minister will be dismayed that there are now two police investigations affecting his government - the other into proxy donations made to Labour, including Ms Harman's deputy leadership campaign. It all recalls Mr Blair's difficulties over the cash for peerages affair which eventually ended with no charges being brought against anyone. That could of course be the result again, but the prospect of another lengthy police investigation will cast a long shadow over Mr Brown's continuing attempts to draw a line under the past.